The Rookery in Dallas. Hmmm… What exactly is the Rookery? Well, when I first heard about it, I had no idea what it was. I had not heard the word before, and I did not know what it meant. Since it was mentioned in one of my many bird email alerts, I knew it had something to do with birds. I also knew that I could probably get some cool pictures of some feathered friends at this rookery place. The rookery had also been mentioned in a few different articles I had read on birds in and around the Dallas area, but no one seemed to know what a “rookery” was. When I googled it, all I got were some links to very old articles, and a map link to the UTSWMC Rookery. Well, having lived in Dallas all my life, I knew that UTSWMC referred to the medical school close to downtown. I couldn’t imagine where this place must be, or what it was going to be like. I had to see for myself. After reading all the very dated articles I could find, I decided I needed to just drive down there and see this place for myself! Before heading down there, I read a couple of old journal entries on the DFW Urban Wildlife Website. There was one article in particular titled Journal – The Amazing UTSWMC Rookery, which caused me to pack my camera bag and head out. One of my favorite images from my morning at the Bird Sanctuary. I love the way she is sitting on the nest and he is watching over her! I felt like he was daring me to try and come closer. I kept my distance, and I was thankful I had my zoom lens with me. 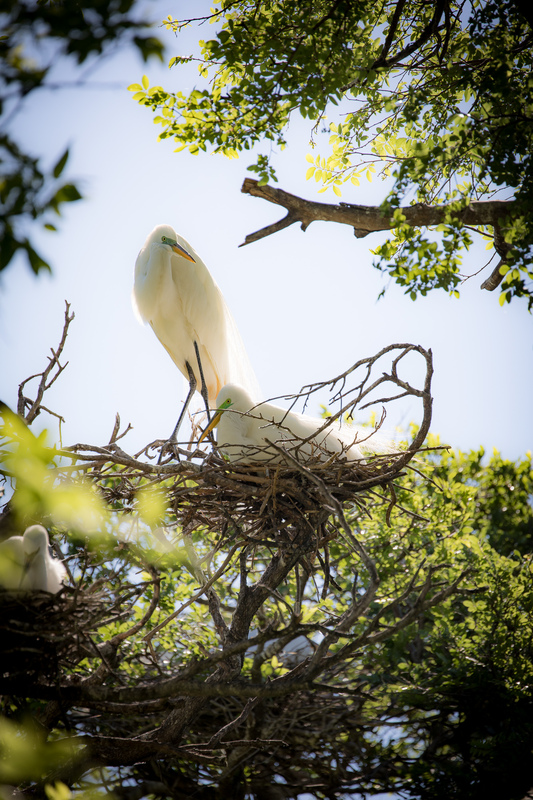 In this article, I read that this place was the home to many Great Egrets, as well as lots of other feathered friends who nested there year after year. Based on what I read, I assumed the birds were pretty tolerant of people taking their pictures, so I thought this would be a great opportunity to test out my new Canon 100-400 zoom lens. That way, I wouldn’t need to get so close to them to get a great picture. Turns out, I didn’t really need that much zoom – these birds are very used to people being around, and I was able to get surprisingly close to many of them. The rookery at UTSWMC (University of Texas Southwestern Medical Center) is also known as “The Bird Sanctuary,” and it is located in Dallas in the middle of an area that is total chaos – the medical district! Not only is it right on the UTSWMC campus, but it is also surrounded by highways, buildings, parking garages, and lots of city construction! On the drive in, all you see are giant hospital buildings, parking lots, and several tall cranes on the many construction sites surrounding the area. This guy was trying to hide from me, but the sunlight hit him just right so I was able to get a photo. This is a Black-crowned Night Heron. Once I parked my car and approached the area of the rookery, I was amazed at the calm feeling that came over me while walking through the actual rookery, or Bird Sanctuary. It was like you were suddenly transported out of the total chaos surrounding the place, and set down in a beautiful little jungle filled with all kinds of trees, plants, and many feathered friends. When I first arrived at the right place (after getting lost several times), I approached the guard’s gate at the entrance to the campus. He asked how he could help me, and I told him I was looking for the rookery. He looked at me like I was crazy and said “What’s a rookery?” I told him that I was looking for the place with the Great Egrets, and he said “Oh, the Bird Sanctuary.” He said “Around here, we call it the Bird Sanctuary, but you’re the second person this week who has called it the Rookery.” He told me that there was one other lady with a big camera that had come in earlier in the day, and he sent me on my way to the rookery on a little winding road through the campus. As I pulled in to an empty parking space, my jaw dropped to the ground. 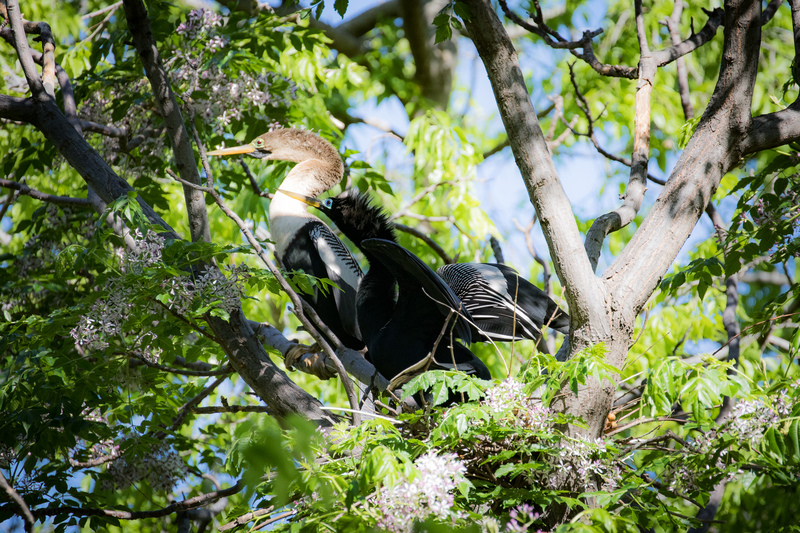 This nest is the home of a male and female Anhinga. A bird I had never seen (or heard of) before! Very strange looking birds, right? Right there, about 10-15 feet from my car, were about 10 Great Egrets just calmly walking across the grounds of the Bird Sanctuary (near the Memorial Garden). I wasn’t sure what to do. I didn’t want to scare them, but I was ready to hop out of my car with my camera and snap some photos. I quietly slid out of my car and began walking towards them. Much to my surprise, they went about their business and did not seem to be bothered by my presence at all! I began snapping away quickly before they flew off. I thought I better get the shots while I can. 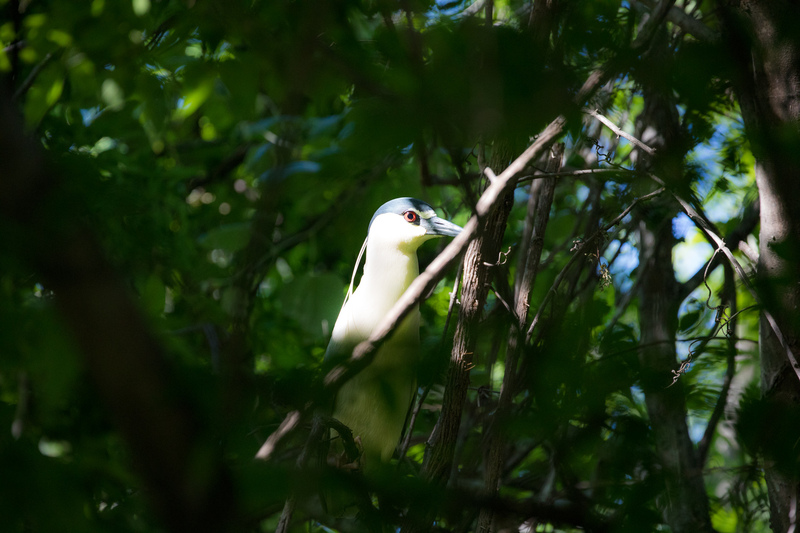 I had no idea that in just a few more feet, near the trees, I would see hundreds more Great Egrets and other feathered friends above my head busily gathering sticks and leaves building nests! They were everywhere! And I mean EVERYWHERE! I finally got my head wrapped around what this place was, and I got my camera into gear! I got so many wonderful photos. The guard at the gate was right – there was one other woman at the Bird Sanctuary, and she did in fact have a giant zoom lens attached to her camera. I’m not sure she spoke English, because when she saw me, she just smiled and pointed up into the trees at some of the Egrets nesting. I passed her several times that morning, and she never spoke a word to me. She always just smiled and pointed to a particular spot in the trees. I wonder what kind of pictures she was able to get – she shot pictures of the same Egret it seemed the entire time I was there. I, on the other hand, was so amazed by all the trees and Egrets, that I walked around the entire sanctuary before I really stopped to take pictures. I had to soak this all in. It is quite a large area, and I wanted too see what was on the other side. So I strolled around the sanctuary just watching these beautiful birds gather sticks and leaves to build their nests. Once I had circled the entire area, I settled in for some photos. 1. a breeding place or colony of gregarious birds or animals, as penguins and seals. 2. a colony of rooks. 3. a place where rooks congregate to breed. 4. a crowded tenement house. If you go to the top level of the nearby parking garage, you can watch them flying high above the rookery! It was amazing! Or, in my words, a rookery is a place where certain birds or animals, such as crows, penguins, and seals, gather to breed. This is the perfect definition for the rookery I visited in Dallas. 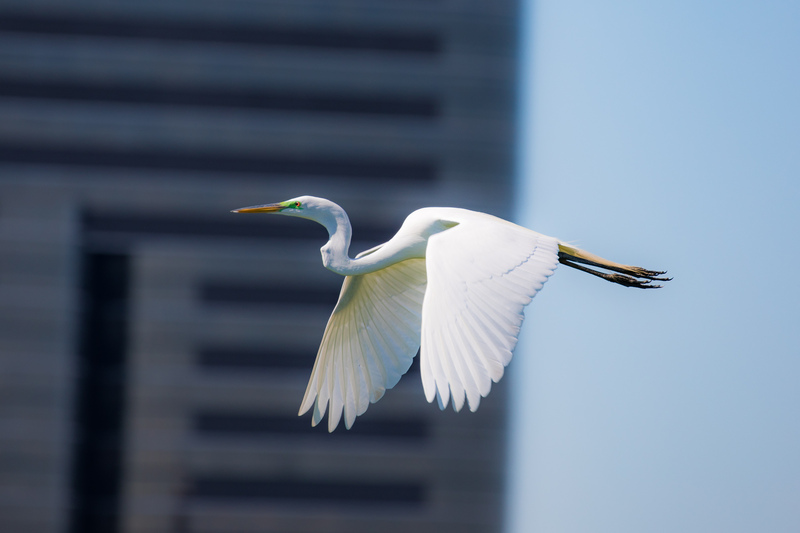 It was a beautiful area, nestled in the midst of construction, traffic, and lots of big tall buildings and parking garages where thousands of winged friends have gathered to nest and breed. It was quite an amazing sight. And apparently, they come to this very spot year after year. I will definitely be going back to this place for a visit (with my camera of course). P.S. Like always, all pictures in this post were taken with my Canon 5D Mark IV. In this case, I was using my Canon 100-400 zoom lens!